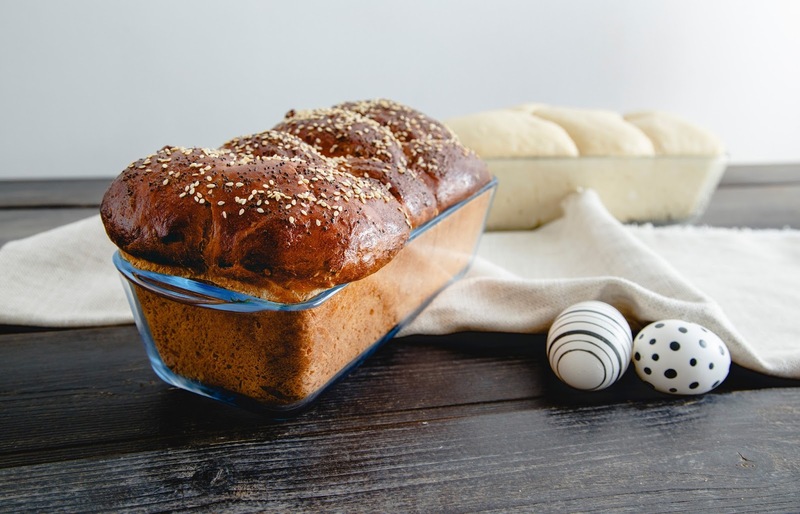 How To Make Challah Bread: Easter Recipe. Fancy making some Challah bread over Easter? Stir the yeast into warm (approx. 40°C) water and leave for 5 minutes. Add the yeast mixture, honey, vegetable oil, salt, flour, eggs and yolks into a Pyrex glass bowl and mix for 8 mins. Scoop out the sticky dough into a large oiled container and cover. Let it proof and rise for approximately 2 hours at room temperature (covered to prevent a skin from forming) until doubled in size. Alternatively proof overnight in the fridge – a cold dough is easier to handle. After the first proof, knock the air out of the dough by folding it and then separate it into three equal portions. Use extra flour for dusting to form three long cylinders. Plait neatly and place the plait into an oiled Pyrex glass loaf dish, tucking the ends underneath. Loosely cover the tin with a damp cloth and let the dough proof a second time at room temperature for one hour. Beat the egg whites and honey together and brush the top of the risen loaf. Sprinkle poppy seeds over the loaf. Put in a preheated 180°C oven. After 45 minutes, brush again with the honey and egg white mixture and sprinkle sesame seeds over the loaf. Bake for a further 15-20 minutes. Check for a hollow sounding loaf by tapping it. Once it is done carefully remove from the loaf dish and cool on a rack. What do you think of this How To Make Challah Bread post? Recipe and images recipe courtesy of Pyrex. 7 Summer Recipes: Alfresco Dining With Pyrex. "Succulent Roast Shoulder Of Lamb"
I miss challah since going GF – the best part of shabbat each weak! You can also braid it and bake on a tray! Love Challah Bread! What a beautiful loaf you have made, Claire!